AS WE KICK OFF THE RIDING SEASON MAY 1ST & 2ND. FOR THESE 2 DAYS DOC’S IS INVITING YOU TO COME ON DOWN FOR “EXCLUSIVE” TWO DAY SPECIALS. Saturday May 1st from 10am to 5pm, Stop Down for FREE Coffee and Donuts as we begin our “EXCLUSIVE” Two Day Spring Open House Specials. 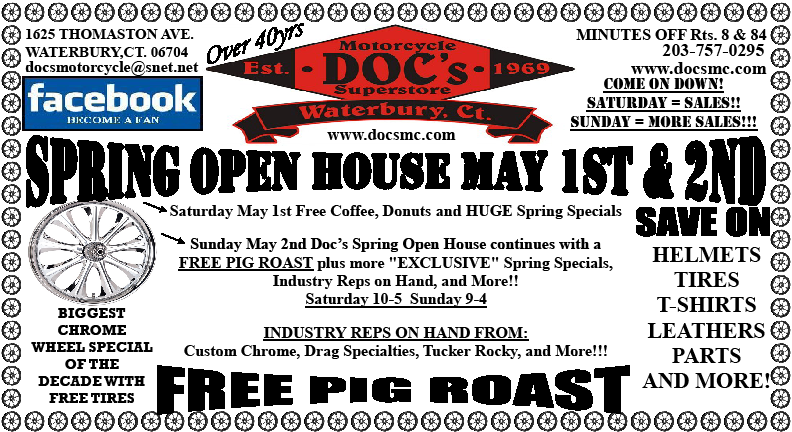 Sunday May 2nd from 9am to 4pm, BE SURE to Stop in for Doc’s Continued “EXCLUSIVE” Two Day Specials, as well as a FREE PIG ROAST!!! Also featured on Sunday will be representatives from all the Major Motorcycle Companies, Reps from CUSTOM CHROME, DRAG SPECIALTIES, TUCKER ROCKY and more showcasing new product lines!!! Each part of Doc’s “EXCLUSIVE” Two Day Specials. HELMETS, TIRES, T-SHIRTS, LEATHERS, PARTS, and MORE!! !